Two institutional celebrations occurred this March: on the 3rd, BIREME completed 51 years and on the 27th, the Virtual Health Library (VHL), the Center’s main technical cooperation strategy, celebrated its 20th anniversary. Together with the efforts of its institutional supporters, users, contributors, and different actors, BIREME is continually invested in the effort to achieve its objective of contributing the development of health in the countries of Latin America and the Caribbean through the democratization of access, information publication and use of knowledge and scientific evidence. In order to assist the health priorities of the Region, BIREME, along with a network of national institutions, develops scientific health information products and services such as the VHL, Literatura Latino-Americana y do Caribe em Ciências da Saúde (LILACS – Latin American and Caribbean Health Sciences Literature) and Descritores em Ciências da Saúde (DeCS – Health Science Descriptors). The VHL counts with 109 national, thematic and institutional instances in 30 countries, as well as with the VHL Regional Portal, which holds over 27 million documents, of which there is full text access to over 10 million, and that registered over 13,6 million accesses in 2017. Emphasizing the importance of the VHL, the VHL for Traditional, Complementary and Integrative Medicine for the Americas (TCIM VHL) was launched in March during an international event in Rio the Janeiro which was attended by the Director of PAHO/WHO, the Director of BIREME/PAHO/WHO, the Brazilian Minister of Health and other Brazilian authorities. The objective of this thematic VHL is to share information that will strengthen interculturality and the articulation of traditional, complementary and integrative medicine during the decision-making process in the field of health in the Americas. In the Caribbean, the Caribbean Public Health Agency (CARPHA), together with BIREME/PAHO/WHO and the Faculty of Medical Sciences of the University of the West Indies, developed the CARPHA EvIDeNCe Portal, in order to render published literature and non-conventional literature readily available and accessible so as to support the decision-making process in the Caribbean. A project for expanding the influence of the documents available to users is also being developed in the CARPHA EvIDeNCe Portal. These are a few facts and lines of action that reinforce BIREME’s position as an institution and Specialized Center of the PAHO/WHO during its 51st anniversary, as well as its mission to support and strengthen health information systems in the countries of the Region. There is much to look forward to during BIREME’s 51st year in terms of activities and the reinforcement of its presence and relevance in Brazil, Latin America and the Caribbean. First, the implementation and the approval of BIREME’s 2018-2019 Biannual Work Plan (BWP) which demanded collective effort from the technical and administrative areas, led by Dr. Diego González, in coordination with the PAHO/WHO. Integrated by four main Projects, 36 Products and Services and 206 Activities and Tasks, the BWP formalizes the Center’s main technical cooperation program and administrative priorities, which incorporated the new Department for Evidence and Intelligence for Action in Health on January 1st, 2018, headed by Assistant Director Dr. Francisco Becerra. 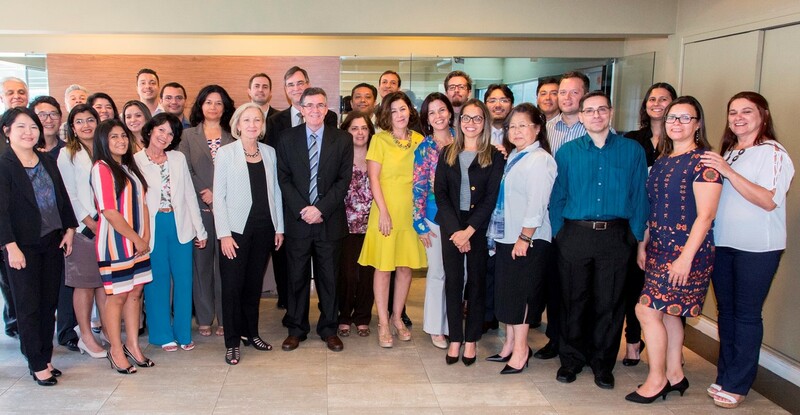 One of the main lines of action in 2018, which will mobilize BIREME and its Network of collaborating centers, partners and institutional supporters, is the 10th edition of CRICS10 – Regional Congress on Health Sciences Information, which will take place on December 4-6th in São Paulo, Brazil. The event, led by the theme “Advancing towards the 2030 Agenda: contributions of evidence and knowledge”, is structured upon six axes. The CRICS is one of the most important and consolidated forums in scientific and technical information of the Region, and it will be held together with the 7th VHL Regional Coordination Meeting (VHL7). The Virtual Health Library (VHL) is BIREME’s main technical cooperation strategy. During its existence, BIREME has gone through periods that can be differentiated by the scientific and technical information models that were used at the time. Between 1967, when it was created, and 1987, BIREME operated through decentralized information networks, integrated by many libraries and documentation centers, which created the Latin American Index Medicus (IMLA), which would later become the LILACS database. In the late 80s, the Center begins to delegate the bibliographic control functions of scientific publications to the countries of the Region, holding a national coordination institution in each country and maintaining control of the process through the creation of the Latin American and Caribbean Health Sciences Information Center. From 1998 on, with the use of the Internet as the main platform for cooperative production and sharing of information sources and flows, the Virtual Health Library (VHL) is launched during the IV Regional Congress on Health Science Information (CRICS4), in San José, Costa Rica. According to the definition from the VHL Guide, a publication constructed collectively by the BVS Network and that brings together a set of procedures, methodologies and applications for its management and operation, the VHL is a network of information management and health science knowledge and evidence exchange, which is established through cooperation between producing institutions and professionals, mediation, and usage of health science information sources, all in open and universal access on the Web. Established as a strategy for technical cooperation on health science information in the region of Latin America and the Caribbean, it is extensible to other developing regions. The VHL is promoted and coordinated by the Pan American Health Organization/World Health Organization through BIREME. The VHL has been strengthened from its creation by its network of libraries and documentation centers, as well as by research centers, education centers, governmental and nongovernmental organizations, producers, intermediaries, and end users of scientific and technical information. The VHL Network is composed of over one hundred national, thematic and institutional instances in 30 countries. The VHL Network has portals created over two decades ago, such as the Public Health VHL, others that are composed of many instances, such as the Brazil VHL, and recently launched virtual libraries, such as the TCIM VHL.